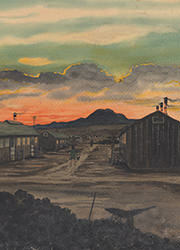 Join us on Monday 15th at 3:00 pm in the Sterling Memorial Library Lecture Hall for "Loyal Citizens, Prisoners of War": America's Concentration Camps – an illustrated talk given in conjunction with the Out of the Desert exhibit, currently on view in the SML Memorabilia Room. A coffee reception will be held just before the talk. This talk is part of the week long series of "Remembrance Day " events.